The idea behind using a UK Trade Association benefits both customer & contractor in that it offers an insight into the professionalism of the company that has been granted membership and offers a decent level of consumer protection for customers. In order for the contractor to be approved they go through a vetting procedure that covers guarantees, track record, training and in some cases, financial stability – for a company to go through the process it shows that they are keen to show that they are to be trusted. 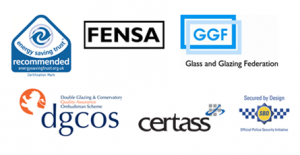 Competence is also covered by some of the association in that FENSA & CERTAS are “competent person” schemes and this allows their members to certify that any installation meets building regulations and this is very important – if your builder cannot self-certify then you will have to get it done at the cost of time & extra expenses on your part.